View “Heritage Walks – Cambridge Domain” in a larger map. 1. The Domain Gates, designed by McNab & Mason were erected in 1911 for £298 10/- in memory of Thomas Wells who was the first chairman of the Cambridge Domain Board in 1880 – a position he held for 25 years. Thomas Wells and his committee put in many hours of spade work to create, from a virtual wilderness, a park which has become well known all over New Zealand. Trees and gardens were planted, lawns and paths laid, bowling greens and tennis courts created – making it a beautiful peaceful spot in the middle of a busy town. The paths are named after the chairmen of the Domain Board and trees of note are the Cedar of Lebanon, Kauris, large chestnuts, oaks and planes. A Camelia Grove was planted in 1962 and puts on a beautiful display in spring. 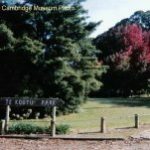 Voluntary organizations including the Te Koutu Lake Improvement Society, Jaycees, the Beautifying Society, Lions and Cambridge Borough Council (Waipa District) Parks and Reserves staff have continued to put many hours into the beautification of this Domain. In 1993 the Tree Trust and Lions erected the viewing platform, Tree Trail maps and started labelling the specimen trees. 2. Behind the former Railway Station is a large depression where in World War Two the NZ Air Force had a tank of aeroplane fuel. 3. Carters Flat was unofficially named after William Kennedy ‘King’ Carter who arrived in Cambridge in 1878 with a coach service carrying the mail and passengers between Auckland and Rotorua. He also had stables and a Horse Bazaar in Kirkwood Street cashing in on the keen demand for Cambridge horses. Carter’s house in Carters Flat has since been demolished to make way for more industrial development. From 1907 the Webb family farmed the land here and after World War One the Cambridge Branch of the Auckland Acclimatisation Society raised pheasants for game shooting. 4. Some of the Gum trees down Carters Flat were planted in 1875. The grove of Kauri seen at the entrance to lower Te Koutu Domain was planted in 1958 and the claret ash fronting Albert Street put on a magnificent show in the autumn. 5. A Tennis Club opened in Cambridge in 1885. ‘At the commencement of the season there was scarcely a member who understood the game but perseverance and constant practise has brought to the front several fairly proficient hands.’ (Waikato Times 14 May 1885). From 1898 to 1912 tennis shared the site and pavilion with the Cambridge Bowling Club. Tennis then moved to their present site and by 1922 had increased their courts to four. The current pavilion extended to include squash courts in 1963. Beside the courts is a Japanese Maple (Acer palmatum) which is the only survivor of three trees given to Cambridge by Missionaries. This is a busy part of Te Koutu Domain which includes the Girl Guides’ Hall, playground and a Hinuera stone ‘wishing well’ donated by the Rotary Club. 6. The ‘Olympia’ Flow Forms, which cascade down to Lake Te Koutu, were designed by Hastings sculptor Iain Trousdell and put in place in 1989. 7. The Cambridge Society of Art’s Gallery has been in Te Koutu Domain since 1985 (in the former Ladies Bowling Clubrooms). The society has been active since 1964 with the gallery open on Sunday and Tuesday afternoons and the works by local artists for sale. The Ladies Bowling Club joined the men’s club in 1983. 8. The Begonia House and fountain were built in 1986 to commemorate the Cambridge Borough Council’s Centennial. 9. The Children’s Playground was established in 1919 on the site of a former ‘stop over’ pa used by the Maori on their way from Pirongia to Maungakawa. King Tawhaio called Te KoUtu Lake his Te Okohoroi – ‘wash basin’. 10. The covered Arbour and wide steps have always been a popular spot for a wedding photo. 11. At the entrance to the bowling club is a gateway erected in 1936 for the Borough’s 50th Jubilee. The four pillars are of Putaruru stone. 12. The Bowling Pavilion was built in 1914 by Fred Potts from plans by A B Herrold, and additions were made in 1938. It is of Edwardian design in a beautiful setting and cost £350. The Cambridge Bowling Club was established in 1898. 13. The octagonal Band Rotunda was built by J Christie in 1908 for £280 from a kit set sent out from the Glasgow Ironworks. It has ornate cast iron fretwork palisades with sunflowers and birds, and musical lyres in the brackets supporting the roof. The ceiling is of reeded kauri and the concrete work was done by Mr Henry Preece.